Food is often at the very top of French conversations. The French always comment on their food and at home, a cook always expects many compliments. So today, we’ll study how to make positive and negative comments about food. If you are invited in a French home, you will have to comment on the food. Several times. Just saying “c’est bon” is not going to cut it if you want to follow French etiquette. Even in a restaurant, it is common to express your satisfaction or disappointment to the waiter, and even sometimes to the chef – in a smaller restaurant, the chef will sometimes come out to talk to his customers. And he is fishing for compliments. If you have to remember one compliment, I would go with “c’est délicieux” (it’s delicious): simple, yet very effective. Note that the French comment on everything: the taste of the food and quality of the produce of course, but also the presentation, which is very important as well. Mmmm, c’était absolument délicieux ! Le poulet était tendre, l’assaisonnement très fin et les légumes croquants. Berk, c’était absolument infect ! Le poulet était super dur, l’assaisonnement complètement fade et les légumes beaucoup trop cuits. La présentation est magnifique /superbe. Que/Comme la présentation est belle. Difficult to translate literally. But it means “how pretty” , talking about the presentation. J’en ai l’eau à la bouche (idiom). The sound the French will do when something looks appetising / tastes good – you’ll hear a lot of “Mmmm” when the French are eating! I am really enjoying it/I love it. It’s delicious – a bit more old fashion. La viande est très bien cuite, et tendre. The meat is very well cooked, and tender. The vegetables are nicely crunchy. Mmmm ! C’est vraiment délicieux !! La viande était super dure. The meat was super tough. It was really over done. C’était pas assez cuit / c’était cru. It was not cooked enough / raw – you may be exaggerating a bit there but it’s OK! Le poulet était tellement fade. The chicken was so bland/tasteless. La sauce n’avait aucun goût. The sauce had no flavor. Les huîtres n’étaient pas fraîches. C’était trop sucré / salé / fort / poivré / épicé – piquant / lourd / brulé / glacé. It was too sweet / salty / strong / peppery / spicy / heavy / burnt / very cold. Or in common slang: c’était dégueulasse (short “dégueu”). 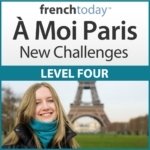 You will find many comments on food used in context in my intermediate level French audiobook À Moi Paris 4, chapter 13 and 14 “Dans Un Grand Restaurant”.